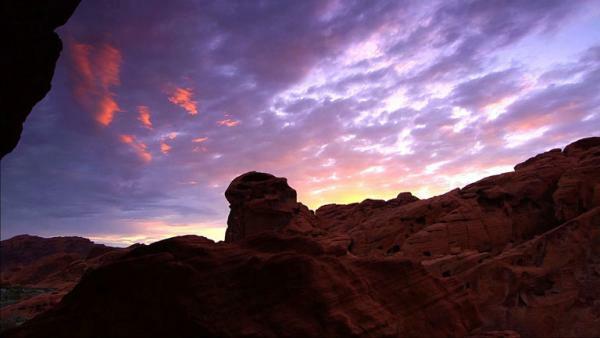 Valley of Fire State Park's stunning red rocks and bright blue skies set the stage for an outdoor destination that is tough to beat. But these hidden canyons and sandstone caves are relatively unknown because they are overshadowed by the bright lights of nearby Las Vegas, Nevada. After exploring the Valley of Fire, Greg and Dave headed to the northern end of Lake Mead. There is over 500 miles of shore line to explore. Then, they hiked the Elephant Rock Trailhead. While the huge panoramic views are always impressive in the desert, focusing your attention on the smaller things always pays off -- noticing the way a small shrub balances with the sandstone or spotting a Chuckwallas, which is a large lizard. After host Greg Aiello showed guest hiker Dave Denny another outdoor wonder near Las Vegas -- Lake Mead -- they hit up the Elephant Rock Trailhead to explore some of the sandstone formations.